Each sunrise brings sunshine. But, eventually, that sunshine must give way to a sunset. The same similarly goes for Love Live! Sunshine!! 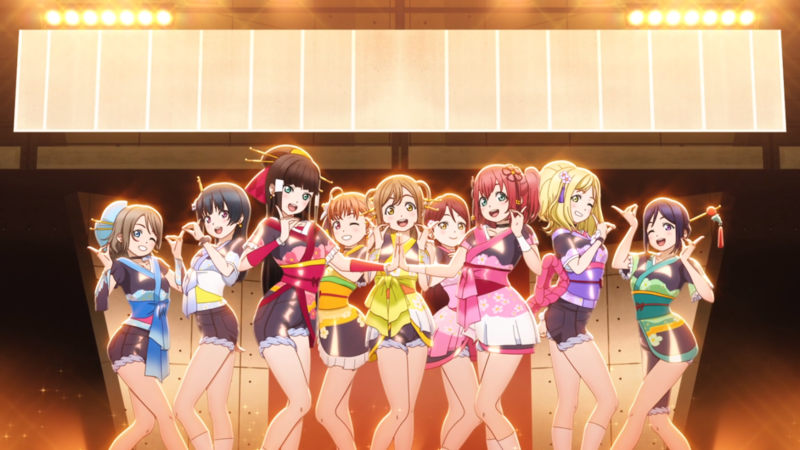 2nd Season, a metaphorical sunset for the school-idol group Aquors and their hard-fought journey. While it does not sing nearly as loudly or as proudly as its prequel, a few rays of hope sneak in nonetheless. Sunshine 2 (as it will be nicknamed from here on out) picks up almost right after Sunshine 1. The group still has its sights set on saving their school, banding together anew to tackle the Love Live gauntlet again. Not as separate ladies but as a unified unit with a more-than-zero mentality. This subtle difference appears as Sunshine 2 basks in slice-of-life goodness. 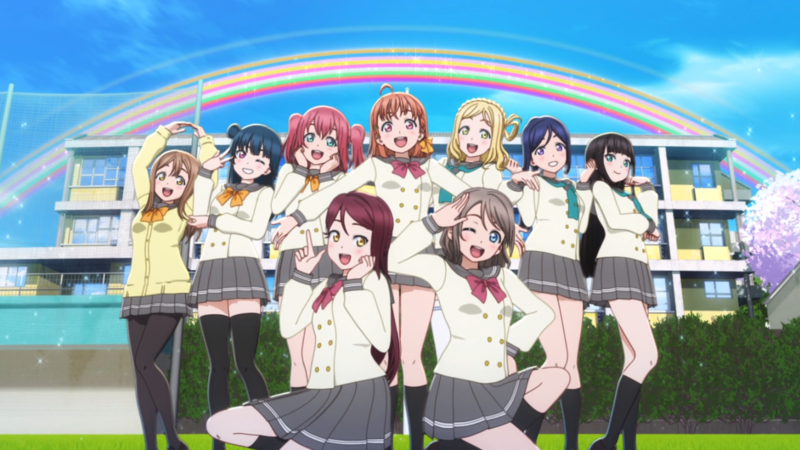 Several episodes aim to highlight the quirks and the challenges of the girls in a less dramatic manner, such as episode four with Dia wanting to grow closer with the younger members or episode five with the doggy dispute between Yoshino and Riko. Not that the series has never had its fair share of this type of content. However, these events align much more with exploring these characters and their situations rather than going for introductions or resemblances (which its first season already did). 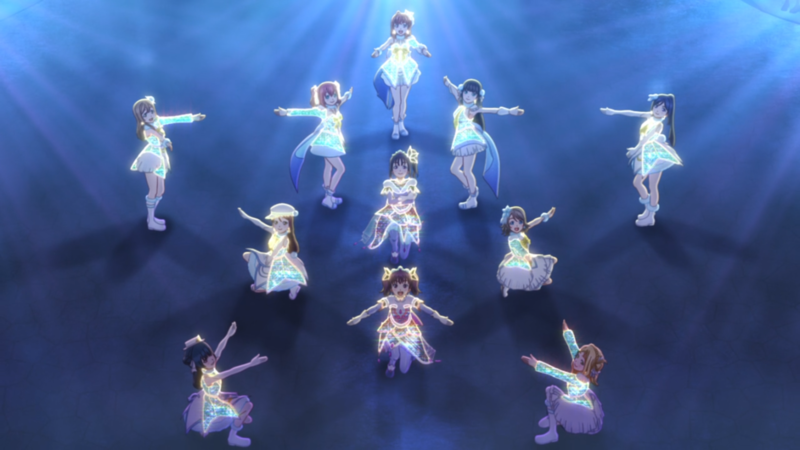 Key to the Love-Live formula, Sunshine 2 also incorporates those team-related aspects. They collaborate to write songs. They stick with each other during melancholic happenings. They go on a road trip that solidifies their fortitude (and defies the laws of physics). 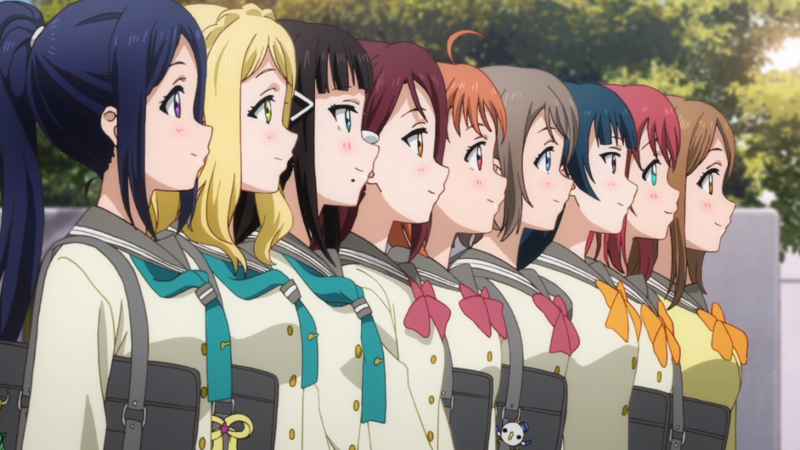 Chika, Riko, You, Yoshiko, Hanamaru, Ruby, Kanan, Dia, and Mari may be a bunch of individuals, but, when together as one, this season proves they are Aquors first and foremost. This last season also champions the same atmosphere, making sure not to lose sight of its Love Live origins outright. The mood of the anime maintains that comedic angle as always, and the ultra-optimism in-between, while maybe overbearing at times, continues to lend itself well to an uplifting experience. But the narrative overall is a downgrade. Where their beginning is mired with loss and difficulty, their ending here stands in stark contrast as a meteoric rise to the top ensues. Granted, the Love Live spectacle itself isn’t really the point of the story being told, especially in this instance where it represents a spiritual win for all involved. Still, a weakened thematic presence and this missing drama reduces impact in the story. Sunshine 2 tries to make up for that easier rise with its increased focus on the threat of the school closing, but it doesn’t always come through. This dilemma can sometimes get lost amidst its other interpersonal scenes, and their vehement need to keep it around isn’t exactly quantified or justified besides the notion of memories and attachment. Traits the audience do not see much of let alone can relate to. To its credit, though, the bittersweet direction is interesting, both because of this franchise’s inherent optimism and because it once again chooses to move away from those that came before it. Thus, despite those narrative troubles, Aquors’s journey concludes in solid-enough fashion. The interim between this season and the previous season is negligible, so the artistic vision for this next iteration remains practically the same. So, to keep it short and sweet, this sameness is a welcome return to likable form. The proof is in the performance. For instance, the character designs remain collectively cute yet individually distinct among the lot. Their musical attire takes on a colorful and charismatic look per usual. Choreography for their dances is still easy to follow (CG or otherwise). Increased actual animation highlight the fun in their actions. Expressions contort into hilarious responses. Sunshine 2 fails to have its settings and backgrounds reach the same level as these other visual elements, but that’s perhaps expected since (to reiterate) the artistic direction has been carried over into this sequel season. That also means that it reaches the same level of strength as before, so it’s certainly not a major problem. In Sunshine 1, establishing the characters meant exploring their reasons and their struggles before joining on as an official member. Here in Sunshine 2, the anime explores other conflicts surrounding the ladies, but it also has a much tougher time juggling them in conjunction with the plot. A few characters certainly have their moments. 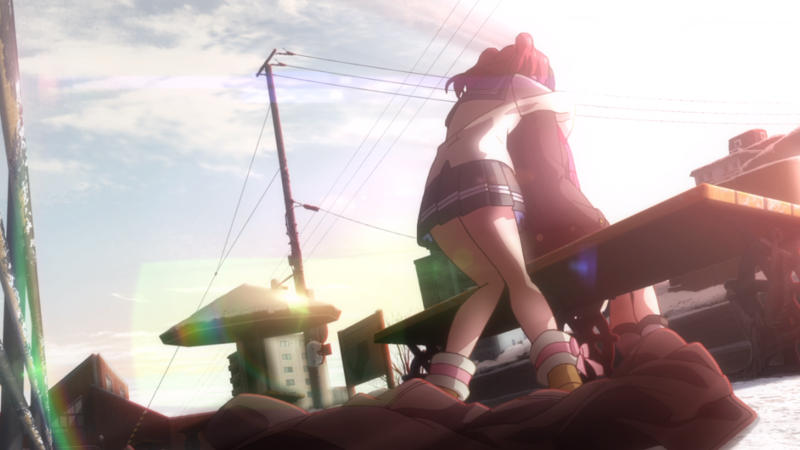 Ruby receives a large amount of attention as her relationship with Dia, her older sister, becomes a point of contention regarding maturity and “moving on” later in the season. The anime steps it up another level when it draws parallels between them and the sister duo of Saint Snow. And Chika herself earns some time as the prospect of failure challenges her determination and her resolve (in flip-like motion) not only for the sake of the rest of Aquors but also for her own sake, too. Yet some characters seem woefully left out: Hanamaru, You, and Mari come to mind first. Phrasing it obtusely, they’re there but not there. Hanamaru seems reserved for comedic relief only. You sticks with mostly a supportive role. And Mari exists as the arbiter of the closing school and not much else. Arguably speaking, these characters had their problems already taken care of in Sunshine 1, but so did everyone, so it feels odd to leave a sizable chunk of the cast on the sidelines. Sunshine 2 gets back on track when it enlarges the scope from their singular characters to the intrateam dynamic. For example, third-years Mari, Kanan, and Dia (Dia, as can be gleaned from this analysis, appears to be around the most) acknowledge their separation after graduation but likewise know that, at least in their hearts, they’ll be together forever. More generally, they rally around each other as a group, solidifying their camaraderie as their shared reams become a reality. It happens a lot. Back in episode three, they initially split up to take care of two back-to-back events but eventually realize that their strength derives from their collective. Even the smaller pillow-fight scene before the big night in episode twelve helps to highlight the friendships they have fostered over the course of their whole adventure. Yet other dynamics hit speedbumps as well. 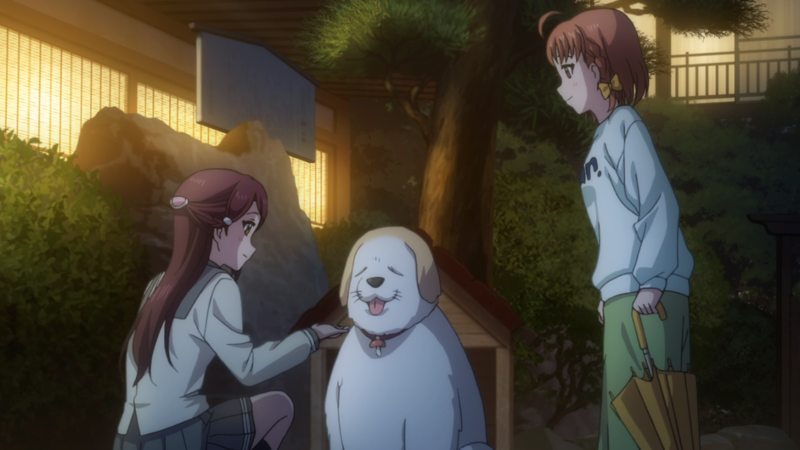 Chika and Riko’s relationship, despite being so vital in the first season, fizzles out to some extent. And, despite being around one another for so long now, the ladies rarely cross party lines, sticking with their year’s internal group for the most part rather than crossing over, missing out on jokes and possible bonds as a result. In the end, Sunshine 2 simply doesn’t have as much to say about Aquors. Be it because of the strife they already went through last season or this season’s failure to really include everyone in the festivities, it leaves the nine girls in a precarious position. Per usual, the various parts of the audio within a music-centric anime like Sunshine 2 are held to a slightly higher standard. Unfortunately, this season succumbs to a middling rendition once again. The opening track, “Mirai no Bokura wa Shitteru yo”, has a similarly grand feel as last time, using bells, drums, pianos, and other brass instruments. But the first half or so of the song misses out on catchiness and intrigue as the buildup meanders. However, the second half swoops in with tons of passion as the vocals soar with that mandatory optimism. As for “Yuuki wa Doko ni? Kimi no Mune ni!”, this new ending track follows suit as well in a negative fashion. It’s an okay track with more of a fantastical feel, a neat little lyrical “reverb” part near the end, and many different takes done by different members of the cast. Sadly, though, okay just doesn’t cut it. Especially so when the insert songs of Sunshine 2, at least a couple of them, demonstrate maturity and prowess in both the song writing and the musicality. A special shout-out goes to one such song: “Awaken the power”. While ironically not an exclusively Aquors song, it stands as one of the best the whole franchise has put together thanks to its changes in pacing, instrumentation, and vocal delivery. Moving on, the original soundtrack also starts to grow on the listener. It was already pretty swell, but its main motif and poignant arrangement, found throughout several tracks, elicits even more emotion, either because the series is coming to a close itself or it has been lightly patting the audience on the back for the past twelve (twenty-four in total) episodes now. And the voice-acting performances remain passable in execution. The women behind Aquors sound more comfortable in their roles when compared to the first season, and their experience in talking and singing moves ahead a bit. Again, while nothing special, their relative newbie status and their commitment to these quirky personalities deserves some props within Sunshine 2 for sure. I greatly liked the first season, so I selfishly expected the same here. It didn’t quite reach that same level of entertainment, but I can’t lie and say I didn’t find myself laughing or smiling or cheering during its run. 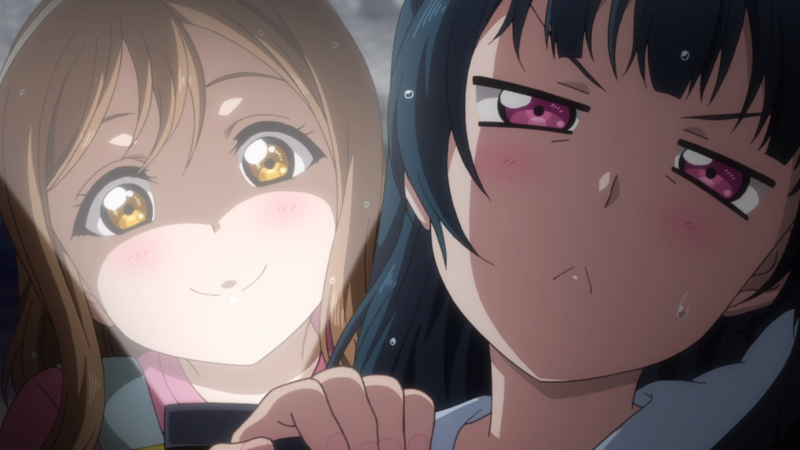 My favorite characters Yoshiko and Hanamaru were in full force with their silliness and their reactions. Sometimes they would team up for duo hilarity, and I liked them all the better for it. Kanan, one of my other favorites, wasn’t as prominent, but her “hug” line as she got scared of the dark was too cute to forget. Of course, I still liked the rest of the cast as well. Riko dealing with her fears. Ruby and her “Rubesty!” catchphrase. Mari’s frequent English usage. You with her saluting as always. And Chika leading with happiness aplenty. Maybe oversaturation occurs with their signature jokes, such as Dia’s “wrong-answer” buzzing and definitely Yoshiko’s “It’s Yohane!” response. Nonetheless, they were all once again a likable troupe of idols who not only tried to the best of their ability but also created a heartwarming environment whatever they happened to be doing. Lastly, the performances were often a spectacle as always. The meanings behind them and the concert-esque structure. So many colors and formations. So much winking and hand flourishing. Emotions for days. I’m a huge metalhead (e.g., black metal, death metal, and each subgenre therein), but I found myself grabbed by their setpieces for the last time. And so, this chapter of the franchise concludes (save for whatever other films and song-releases they have on the horizon; announced or otherwise). It hasn’t been the most perfect or sensational follow-up to a beloved series, but this second season – and indeed this entire second iteration – has been a respectable outing regardless. I look forward to seeing where the (inevitable?) third iteration goes next. Love Live! Sunshine!! 2nd Season waves goodbye to Aquors but gives them a solid farewell tribute in the process. While most aspects of this season do not live up to the previous prequel, its unconventional plot direction, its nice production values, and its strong sense of entertainment make up for some of the woes in its character writing. But no worries. There’s always another sunrise right around the corner. Thanks for taking the time to read my review.